I guess I could tag this one under “creative direction” because we did end up with a uniform look for a series of tapes, social media channels, show posters etc. However, I think that the greater accomplishment here was creating an operational modus for Max Petersen, one which would allow him to have a structure for creating new music, a way of sharing and promoting it, all the while working up to his full length release. 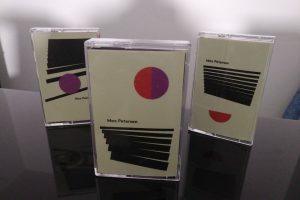 The idea was to record and release a series of mixtapes (3 in total) on actual cassette tapes, with compositions recorded specifically for these releases. 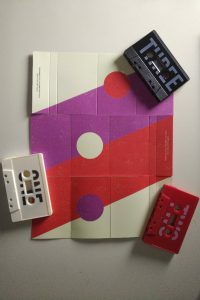 The fact that these were actual cassette tapes was meant to signal the fact that the material here is in demo form – in that there is a sense of experiment and exploration going on here (with the forthcoming album in mind) – but that this is also music that should be honoured, hence it’s not presented in the form of digital files only. For the artwork, once again, I worked with the beastly Animisiewasz aka Maciej Grochot. I knew that Max loves Kandinsky, so I created a mood board that included some of his more minimal / musical paintings, as well as some analogous examples of minimal, Japanese design. Max is actually a fan of Kandinsky’s Der Blaue Reiter period, but unfortunately the paintings from that time lack that musicality and graphic / poster quality that would translate well to design, hence the mild adjustment of the references. The final idea I came up with was to create a design that will unfold and evolve over time (with the release of every mixtape), but that in the end all of these individual releases will come together to create a unified series visually. Maciej nailed it! And Max celebrated the project with a beautiful show at the legendary MOODS!